Smaller and cooler than the gas giants, Neptune and Uranus are classified as ice giants. It’s a good name, since they do have large quantities of water ice mixed in with a largely hydrogen and helium atmosphere. There’s very little water at the cloud tops, but the percentage of water increases as you descend towards the heavier core. Could there be a layer on Neptune with enough pressure and temperature for liquid water to form into vast oceans? 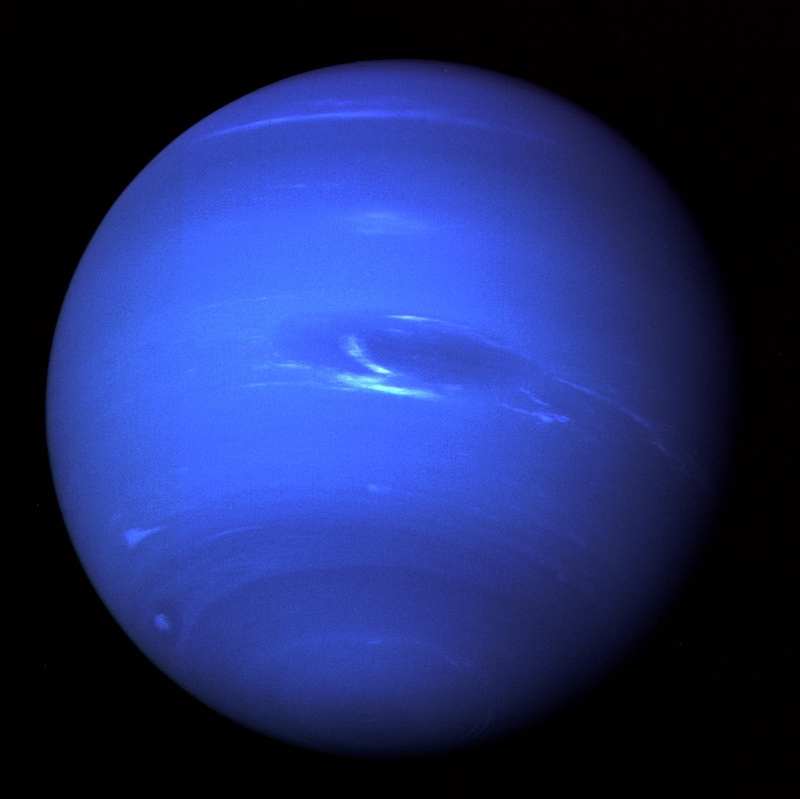 And if not Neptune, what about a Neptune-like planet orbiting another star? First, a little about Neptune. This “ice giant” planet orbits the Sun at a distance at about 30 AU (30 times the Earth-Sun distance). Its surface temperature is a frigid 50-degrees above absolute zero, but temperatures increase as you descend down through the cloud tops because of residual heat from its formation. Its upper atmosphere is 80% hydrogen and 19% helium with a few other chemicals. Trace amounts of water is visible in Neptune’s upper atmosphere, but astronomers believe the ratio of water increases as you pass down through the cloud tops. Planetary scientists have theorized that water could exist deep down in Neptune’s solid core, in an ionic state, where temperatures are thousands of degrees Kelvin. But there might be a spot higher up, where temperatures are cooler (less than 800 K) and pressures more reasonable (less than 20 kbar) then vast oceans of liquid water could form. But it’s a tricky balance. Whether or not an ocean can form depends on the water to gas mix in the atmosphere at the right temperatures. As you descend through the atmosphere, the ratio of water to hydrogen increases. At the same time, water can only condense out of the atmosphere when the temperatures are cool enough. If it’s too hot, or the ratio of water is too low, you’ll just get a cloud base – something like fog above Neptune’s more solid interior. But if the temperatures are cool enough at the right pressures, and there’s enough water in the atmosphere, it should condense out to form an ocean layer before the clouds begin. Researchers Sloane J. Wiktorowicz and Andrew P. Ingersoll from the California Institute of Technology in Pasadena have done the calculations for Neptune in their new paper, Liquid Water Oceans in Ice Giants. According to data gathered from here on Earth and the Voyager spacecraft, Neptune is probably too dry and too warm for these oceans to form. Wiktorowicz and Ingersoll calculated that there’s less than a 15% chance of oceans on Neptune. But as Neptune cools over time – perhaps in a billion years or so – the chance of water oceans increases to 40%. Neptune might not be a great candidate, but extrasolar planets could fit the bill. As techniques for finding extrasolar planets improve, astronomers should be on the lookout for Neptune-class planets with surface temperatures cooler than Neptune, but a higher ratio of water in the atmosphere. And these should be easier to spot than small rocky planets close to their parent stars. Read the article & loved it. I’m totally into ice giants & super earths. What I would love to see discovered is a mega earth or an ultra earth. That’s my name for a rocky world with the same, massive diameter as Uranus or Neptune. WHY WOULD I WANT TO SEE SOMETHING LIKE THAT??? I just like big worlds. Of course nothing could live on it, no life that we know off. That would be crazy to hope for. One never knows for certain. has the possibility of a layer of liquids been discounted for Jupiter, Saturn and Uranus? It seems pretty likely that even if it’s a shallow layer, they all should have one. or plasma. It seems a stretch to go straight from gas to solid with no transitional layer at all. Then again, strange forces seem to be exerted by these planets.